Octane Render, the ultra-fast unbiased GPU renderer (made in Belgium just like me :-)) is soon going to introduce a new MLT-(Metropolis light transport)-like algorithm, which will make the rendering of certain difficult scenes with small light sources much more efficient: the scene will converge much faster, with less noise and will kill fireflies (bright pixels as a consequence of long paths from reflective caustics). MLT is the base rendering algorithm used by unbiased CPU renderers like LuxRender, Maxwell Render, Fryrender, Indigo Renderer and Kerkythea. Making Metropolis light transport (or an equivalent) work on current GPUs was thought by many to be impossible and it was one of the main criticisms from GPU rendering skeptics such as Luxology (Modo) and Next Limit (Maxwell Render), who believe that GPUs can only do dumb, inefficient path tracing and nothing more. Luckily there's Octane Render to prove them wrong. The fact that it has taken the developer such a long time to make it work shows that it's quite tricky to develop. Octane Render is currently also the only renderer (to my knowledge) that will utilise a more sophisticated rendering algorithm. On a sidenote, ERPT (energy redistribution path tracing) is also possible on the GPU, as described in one of my previous posts. It combines the advantages of Monte Carlo path tracing and Metropolis light transport to allow faster convergence with less noise and can achieve fantastic results, which look indistinguishable from the path traced reference (see http://raytracey.blogspot.com/2010/09/small-update-on-brigade-real-time-path.html) Timo Aila, a graphics researcher at Nvidia and GPU ray tracing genius, is also working on real-time Metropolis light transport (http://research.nvidia.com/users/timo-aila). Octane's MLT-like algorithm has been hinted at by its developer since the unveiling of the software in January 2010, and it should be here very soon (within a couple of weeks, post will be updated when that happens). I'm very curious to see the first results. Future GPU architectures, like Kepler and Maxwell, should make the implementation of MLT-like algorithms on the GPU much easier, but it's nice to see at least one developer trying to squeeze the maximum out of current GPUs, bending their compute capability until it breaks. Kepler and Maxwell: ray tracing monsters thanks to CPU and GPU cores on the same chip? "Between now and Maxwell, we will introduce virtual memory, pre-emption, enhance the ability of the GPU to autonomously process, so that it's non-blocking of the CPU, not waiting for the CPU, relies less on the transfer overheads that we see today. These will take GPU computing to the next level, along with a very large speed up in performance," said Jen-Hsun Huang. We all know that Intel and AMD are looking at merging CPU cores and GPUs on the same die. In my mind, the future is for hybrid computing, where different kind of processors working together and find their own kind of tasks to work on. Currently, multi-core CPU and many-core GPU are working together, tasks are distributed by software schedulers. Data parallel tasks are assigned to GPUs and task-parallel jobs are assigned to GPUs. However, communication between these two kinds of processors is the performance bottleneck. I hope NVIDIA can provide a solution on their desktop GPU product line too. That's exactly right. The future is heterogeneous computing in which we use CPUs (which are optimized for single-thread performance) for the latency sensitive portions of jobs, and GPUs (which are optimized for throughput per unit energy and cost) for the parallel portions of jobs. The GPUs can handle both the data parallel and the task parallel portions of jobs better than CPUs because they are more efficient. The CPUs are only needed for the latency sensitive portions of jobs - the serial portions and critical sections. Do you believe a time will come when GPU and CPU are on the same chip or "board" it seems the logical next step to avoid the huge PCI-E latency and have a better GPU-CPU interactivity ? i know there is ongoing research in this area already ...but what is your personal opinion on the possibility and benefits of this ?" Our Tegra processors already combine CPUs and a GPU on a single chip. For interactivity what's important is not the integration but rather having a shared memory space and low latency synchronization between the two types of cores. I don't see convergence between latency-optimized cores and throughput optimized cores. The techniques used to optimize for latency and throughput are very different and in conflict. We will ultimately have a single chip with many (thousands) of throughput cores and a few latency-optimized cores so we can handle both types of code. My bet is that Kepler will at least have one and probably two (ARM based) CPU cores and Maxwell will probably have 4 CPU cores on the GPU. The inclusion of true CPU cores on the GPU will make the CPU-GPU bandwidth problem of today obsolete and will enable smarter ray tracing algorithms like Metropolis light transport and bidirectional path tracing on the GPU. Biased rendering methods such as photon mapping and irradiance caching will be easier to implement. It will also give a tremendous performance boost to the (re)building of acceleration structures and to ray tracing of dynamic geometry, which will no longer depend on the slow PCIe bus. Apart from ray tracing, most other general computation tasks will also benefit greatly. I think this CPU/GPU combo chip will be Nvidia's answer to AMD's oft-delayed Fusion and Intel's Sandy Bridge. It's been a long time since OTOY was in the news, but the company will resurface at GTC. Jules Urbach of OTOY will be speaking in a session about emerging companies. Apparently there's no exclusive deal any longer between OTOY and AMD according to this article at Venturebeat. OTOY will unveil its Enterprise Cloud platform at the GPU Technology Conference this week. The platform is designed to enable developers to leverage NVIDIA CUDA, PhysX and Optix technologies through the cloud. OTOY announced that it will unveil its Enterprise Cloud platform at the GPU Technology Conference this week. The platform is designed to enable developers to leverage NVIDIA CUDA, PhysX and Optix technologies through the cloud. OTOY's proprietary ORBX GPU codec will enable high performance 3D applications to render on a web server and instantly stream to any thin client. OTOY is participating in the GTC “Emerging Companies Summit,” a two-day event for developers, entrepreneurs, venture capitalists, industry analysts and other professionals. The OTOY Enterprise Cloud platform sandboxes an application or virtual machine image without degrading or limiting GPU performance. CUDA-powered applications, such as Adobe's Creative Suite 5, will be able to take full advantage of GPU acceleration while streaming from a virtual OTOY session. In addition to supporting CUDA through its server platform, OTOY's 4k web plug-in adds CUDA and OpenCL compliant scripting across all major web browsers, including Internet Explorer, Mozilla FireFox, Google Chrome, Apple Safari and Opera. GPU web applets that cannot run locally are executed and rendered using OTOY server side rendering. This ensures that GPU web applets can be viewed on any client, including HTML 4 browsers. OTOY enables server hosted game engines to render LightStage assets and leverage distributed GPU ray-tracing or path-tracing in the cloud. The OTOY Enterprise Cloud platform can host complete game engine SDKs, making game deployment to Facebook or other web portals simple and instantaneous. OTOY will add native support for CryEngine content in 2011, starting with Avatar Reality's Blue Mars. Blue Mars is the first virtual world built using the Crytek engine. It is currently in beta testing on the OTOY platform. OTOY is a leading developer of innovative software solutions for GPU and CPU hardware, as well as a provider of convergence technologies for the video game and film industries. OTOY works with a wide range of movie studios, game developers, hardware vendors and technology companies. OTOY integrated in CryEngine and supporting distributed GPU ray tracing and path tracing in the cloud!! The dream of real-time ray traced or even path traced games is getting closer every day! I do hope that OTOY will deliver this dream first, they have all the right technology and partners now. "After some complains pointing out that in the movie, ERPT is significantly darker then path tracing , I fixed the darkening effect of the ERPT image filter, solving the difference in lighting quality. I made an image ( http://img844.imageshack.us/img844/7... ) using ERPT for the left half, while using path tracing for the right half and waited until the path tracing noise almost vanished. As you can see, the lighting quality between the left and right half is pretty much the same. (The performance and convergence characteristics remain unchanged)"
It would be interesting to know the time for ERPT and for path tracing to achieve these results. As the videos show, ERPT converges considerably faster than standard path tracing and the noise is significantly reduced. Very cool and very impressive. I wonder if the optimized ERPT code will be used in Brigade for real-time animations and games. VoxLOD: interactive ray tracing of massive polygon models with voxel based LOD + Monte Carlo global illumination! "a real-time massive model visualization engine called VoxLOD, which can handle data sets consisting of hundreds of millions of triangles. It is based on ray casting/tracing and employs a voxel-based LOD framework. The original triangles and the voxels are stored in a compressed out-of-core data structure, so it’s possible to explore huge models that cannot be completely loaded into the system memory. Data is fetched asynchronously to hide the I/O latency. Currently, the renderer runs entirely on the CPU. 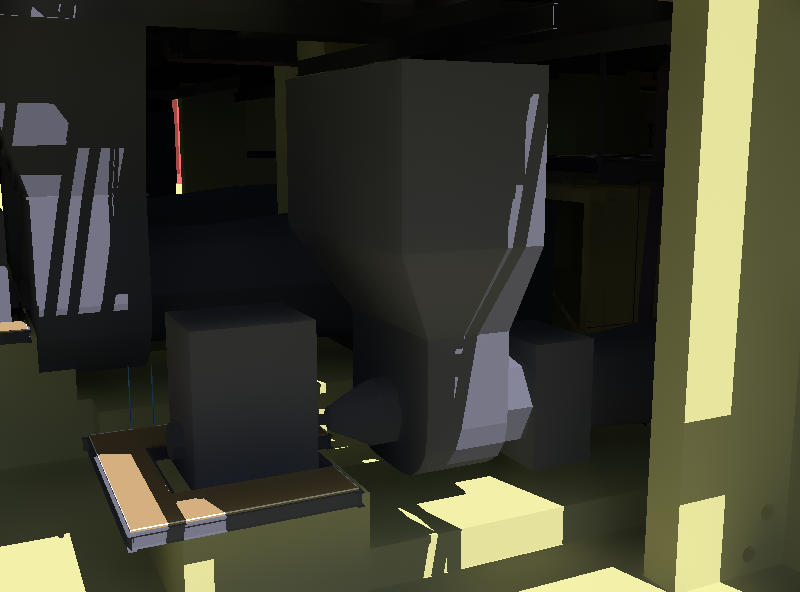 I’ve implemented shadows in VoxLOD, which has thus become a ray tracer. Of course, level-of-detail is applied to the shadow rays too. While shadows make the rendered image a lot more realistic, the parts in shadow are completely flat, devoid of any details, thanks to the constant ambient light. One possible solution is ambient occlusion, but I wanted to go further: global illumination in real-time. Note that most of the scene is not directly lit, and color bleeding caused by indirect lighting is clearly visible. There are two light sources: a point light (the Sun) and a hemispherical one (the sky). I use Monte Carlo integration to compute the GI with one bounce of indirect lighting. Nothing is precomputed (except the massive model data structure of course). I trace only two GI rays per pixel, and therefore, the resulting image must be heavily filtered in order to eliminate the extreme noise. While all the ray tracing is done on the CPU, the noise filter runs on the GPU and is implemented in CUDA. 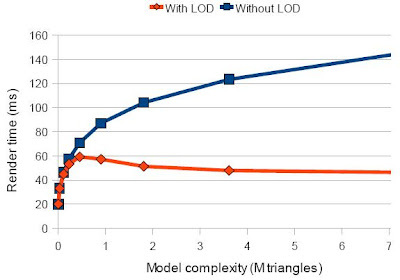 Since diffuse indirect lighting is quite low frequency, it is adequate to use low LODs for the GI rays." The author of this engine has also written a paper entitled: "Interactive Out-of-Core Ray Casting of Massive Triangular Models with Voxel-Based LODs"
"by using LODs, significantly higher frame rates can be achieved with minimal loss of image quality, because ray traversals are less deep, intersections with voxels are implicit, and memory accesses are more coherent. Furthermore, the LOD framework can also reduce the amount of aliasing artifacts, especially in case of highly tesselated models." "Our LOD metric could be also used for several types of secondary rays, including shadow, ambient occlusion, and planar reflection rays. One drawback of this kind of metric is that it works only with secondary rays expressible as linear transformations. Because of this, refraction and non-planar reflection rays are not supported." This is certainly something to keep an eye on! Are there any plans to add fixed function raytracing hardware to the GPU? Fixed-function ray tracing hardware: our group has definitely done research in this area to explore the "speed of light", but my sense at this time is that we would rather spend those transistors on improvements that benefit other irregular algorithms as well. When do you think real-time ray tracing of dynamic geometry will become practical for being used in games? ray tracing in games: I think Jacopo Pantaleoni's "HLBVH" paper at High Performance Graphics this year will be looked back on as a watershed for ray tracing of dynamic content. He can sort 1M utterly dynamic triangles into a quality acceleration structure at real-time rates, and we think there's more headroom for improvement. So to answer your question, with techniques like these and continued advances in GPU ray traversal, I would expect heavy ray tracing of dynamic content to be possible in a generation or two. Currently there is a huge interest in high quality raytracing on the GPU. The number of GPGPU renderers has exploded during the last year. At the same time there are critics saying that GPU rendering is still not mature enough to be used in serious work citing a number of limitations such as not enough memory, shaders are too simple and that you can only do brute force path tracing on the GPU, which is very inefficient compared to the algorithms used in CPU renderers. What is your take on this? Do you think that these limitations are going to be solved by future hardware or software improvements and how soon can we expect them? re offline renderers - I do think that GPU performance advantages are becoming too great for studios to ignore. You can definitely get way past simple path tracing. I know of a whole bunch of studios that are doing very deep dives. Stay tuned! Do you think rasterization is still going to be used in 10 years? There have been a lot of papers about reyes style micropolygon rasterizing at past graphics conferences with the feasibility of hardware implementation. Do you think this is a good idea? re: micropolygons - I think all the work on upolys is incredibly interesting. I still have some reservations about whether upolys are REALLY the final answer to rendering in the future. They have many attractive attributes, like the fact that samples are glued to parametric space and thus have good temporal coherence, but they seem kind of ... heavyweight to me. There may be simpler approaches. am I wrong in thinking that game graphics are limited more by the artist than the graphics or are the game companies just trying to reach a broader market? Image Space Photon Mapping (ISPM) rasterizes a light-space bounce map of emitted photons surviving initial-bounce Russian roulette sampling on a GPU. It then traces photons conventionallyon the CPU. Traditional photon mapping estimates final radiance by gathering photons from a k-d tree. ISPM instead scatters indirect illumination by rasterizing an array of photon volumes. Each volume bounds a filter kernel based on the a priori probability density of each photon path. These two steps exploit the fact that initial path segments from point lights and final ones into a pinhole camera each have a common center of projection. So ray tracing in games will definitely show up well within 10 years and according to Luebke you can expect "heavy ray tracing of dynamic content to be possible in a generation or two". Considering that Fermi was a little bit behind schedule, I would expect Nvidia's next generation GPU to come around March 2011 (on schedule), and the generation after that around September 2012. So only 2 years before real-time raytracing is feasible in games ;-D.